Here’s the dish! Relocating to another city means sometimes you won’t be home with your family for the holidays. Last year, I went home to Atlanta for Thanksgiving and stayed in D.C. for Christmas. After spending a Christmas away from my family, I knew in the years to come, I’d be home for Christmas (instead of Thanksgiving). Here’s the thing about the winter holidays—you eat a traditional feast at Thanksgiving and turn around one month later and pretty much eat the exact same menu, give or take a few dishes, for Christmas. I love when people think outside the traditional box with holiday meals and introduce new traditions. Enter my friends Charaé and Darin Jenkins. 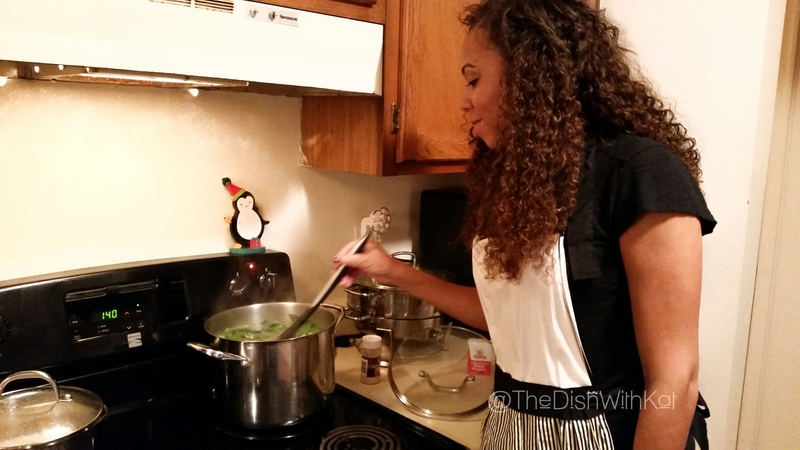 I stopped by the day before to serve as Sous Chef to Chef Charaé, seen here stirring a pot of Collard Greens. Charaé and I attended American University together (#EbonyEagles) and share a love of preparing and enjoying delicious food. She told me started cooking with her mom at the age of six, but she didn’t really start being adventurous in kitchen until she met her husband in 2008. Since then, she’s grown to become an amazing home chef. I sometimes scroll through her Instagram page salivating over the meals she makes for herself and D.J. She’s a culinary creative who does what I love most—thinks outside the box and starts her own traditions. The Jenkinses are known for their festively themed Thanksgiving dinners, and this year, Chef Charaé, as I affectionately call her, allowed me into her kitchen for a glimpse at how she pulls off an amazing meal for her family and friends. Dinner would start with a spread of Sriracha & Wasabi Deviled Eggs, Collard Green Wontons (her own recipe), Pork Hoisin Meatballs, and Cranberry, Ginger & Orange Chutney. The featured meats would be a Soy Sauce & Honey Glazed Turkey and Garlic-Ginger Shrimp. The side dishes to accompany would be Fried Rice (her own recipe), Hot & Spicy Green Beans, and as requested from her husband, traditional Collard Greens and her Million Macaroni & Cheese. Featured desserts would be Sweet Potato Pie and Fortune Cookies. I nearly entered my food coma off the appetizers alone! I ate a half dozen Collard Green Wontons before I decided to stop counting because I wasn’t going to stop eating them. Chef Charaé’s recipe was simple: she gingerly loads prepared collard greens (drained thoroughly), cream cheese, and a special blend of seasoning into wonton papers and deep fries them until golden brown. The Cranberry Chutney ended up being the perfect accompaniment to these little triangles of deliciousness. Seriously, it’s one of my new favorite treats. I ate the ones I took home with me the next morning for breakfast. The Srirarcha & Wasabi Deviled Eggs marinated over night and packed a lot of flavor without being overpowering, which wasabi can sometimes be. And the meatballs. Oh, the meatballs. Succulently juicy and presented with individual appetizer forks, they were a hit with everyone, even the Jenkinses’ four-legged fur baby, Saki, who managed to snag a few of her own for tasting. The Soy Sauce & Honey Glazed Turkey blew me away! Mid chew I admitted that, all these years, my mother has been roasting some pretty dry turkeys (sorry, mom!). Chef Charaé served her turkey with traditional gravy and an assortment of Asian dipping sauces, but to be perfectly honest, it didn’t need a thing. They key to achieving such a moist bird, according to the chef, is roasting it breast side down and continually basting it, then finishing it off right side up. I will definitely use this tip whenever I decide to be brave and cook a bird on my own. The jumbo Garlic-Ginger Shrimp came straight from the heart of D.C.’s seafood district—Captain White’s Seafood City on the Southwest Waterfront. I love that we had the option of a traditional turkey and and the shrimp, which ended up pairing perfectly with the Fried Rice. Sides should always complement the the meal, and Chef Charaé’s sides did just that. We laughed at the fact that we both struggle with cooking rice (I know, I know), but her Fried Rice, which included carrots, onion, eggs, and scallions, stir fried with homemade garlic butter and soy sauce came out perfectly. The Hot & Spicy Green Beans packed a flavorful punch and provided a new twist on what can sometimes be a mundane vegetable. I usually have to force myself to eat my green beans (because I’m a 5 year old at heart), but I scarfed down these beans down like it was my job, and technically, it was. Her traditional Collard Greens featured a smoked turkey leg and onions, which simmered slowly in chicken broth until tender. I had the honor of being the taste tester for her Million Macaroni & Cheese; it wasn’t a tough job at all, and I was happy to do it. It boasts seven different cheeses—yes, SEVEN—including Gruyere, Muenster, White Cheddar, Smoked Cheddar, Smoked Gouda, Colby Jack, and Ricotta. Do yourself a favor and add a smoked cheese into your next pan of mac & cheese; you won’t be disappointed. The smoky goodness of the Gouda and Cheddar takes the flavor to another level, and I loved every bite of it. And of course, Fortune Cookies! There was barely room left for dessert, but I dug deep and found the space in my expanding stomach to eat some pie; I would expect nothing less from myself (lol). Chef Charaé whipped up homemade Sweet Potato Pie (sorry, Patti… no store-bought pies around here), and another guest brought a Havana Dream Pie from Joe’s Seafood, Prime Steak & Stone Crab, which was served with dulce de leche, strawberries, and fresh whipped cream (not pictured). And because it’s all about the details, there were also Fortune Cookies for guests to enjoy. We cracked them open after dinner and read aloud our fortunes. It was a great way to end a wonderful meal and reminded us all that we have plenty to be thankful for. Entertaining is an art form. It’s one thing to invite people over for food and fellowship, but quite another to provide them with a memorable experience they won’t soon forget. I think what I appreciated most, aside from the food, of course, were the little details that made this evening magical and memorable. Chef Charaé is definitely the hostess with the mostest and meticulously thought through the experience she wanted to provide her guests. She looked beyond just the menu for her Asian-themed Thanksgiving. Some of my favorite details included providing guests with chopsticks to use instead of the traditional knife and fork. She went as far as to order Chinese take-out boxes for guests to take food home in. I live for details like that! The main color for her tablescape was red, which represents good luck in the Chinese culture. Chef Charaé doing her thang! Chef Charaé used cranberry and gold for her Thanksgiving tablescape. While a fully stocked bar was available for guests, Chef Charaé also offered a delicious seasonal cocktail—a concoction of Ginger Beer, Apple Cider, and Tito’s Vodka. It was perfect for a guest like me who doesn’t drink enough to figure out my own mixed drink, but still likes to partake in a libation or two (or three because it was really smooth and delicious). The final thing I’ll note that I really enjoyed was the use of real serving dishes and plates. My mother is somewhere saying “I told you so,” and shaking her head (lol). I’ll be the first to admit, I will use disposable items when entertaining for more than 10 people in a heartbeat because it just makes clean up easier. Because we were a small, intimate gathering of family and friends, Chef Charaé made good use of her fancy entertaining pieces—from porcelain platters, to chaffing dishes, to a multi-pot slow cooker. She made sure her deliciously prepared food was well-presented to all of her guests. I love this! We’re so happy that you were able to spend the day with us, and we’re looking forward to many more to come. It’s an open invite in the Jenkins’ household!